Styleguard Semi-Frameless Glass Pool Fencing follows the latest trend in architectural design for pool enclosures. Semi-Frameless tempered glass panels are tough, durable and impact resistant. Glass panels come in heights of 4 or 5 feet and in a width of 5 feet. The thickness of glass panels comes 1/2 inch and 3/8 inch and they are attached to powder coated aluminum posts. The posts are base mounted & core drilled. 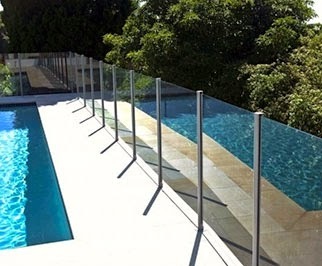 This is a great article on Frameless Glass Pool Fencing. Very informative.